Trilateration using 3 latitude/longitude points, and 3 distances? I want to find out an unknown target location (latitude and longitude co-ordinates). There are 3 known points (latitude and longitude co-ordinate pairs) and for each point a distance in kilometers to the target location. How can I calculate the co-ordinates of the target location? What I'd like is what is the math for a function that takes that as input and returns 37.417959,-121.961954 as output. I understand how to calculate the distance between two points, from http://www.movable-type.co.uk/scripts/latlong.html I understand the general principle that with three circles like these you get exactly one point of overlap. What I'm hazy on is the math needed to calculate that point with this input. After some looking around at Wikipedia and the same question/answer at StackOverflow, I figured I would take a stab at it, and try to fill in the gaps. First off, Not sure where you got the output, but it appears to be wrong. I plotted the points in ArcMap, buffered them to the distances specified, ran intersect to on the buffers, and then captured the vertex of intersection to get the solutions. Your proposed output is the point in green. I calculated the value in the callout box, which is about 3 meters of what ArcMap gave for solution derived from the intersect. The math on the wikipedia page isn't too bad, just need to covert your geodetic coordinates to the cartesian ECEF, which can be found here. the a/x +h terms can be replaced by the authalic sphere radius, if you aren't using an ellipsoid. I'm not sure if I'm being naive, but, if you buffer each point by size, and then intersect all three circles that would get you the correct location? The following notes use planarithmic geometry (i.e. you would have to project your coordinates into an appropriate local coordinate system). Take 2 of the data-points (call them a and b). Call our target point x. We already know the distances ax and bx. We can calculate the distance ab using Pythagoras' theorem. Unfortunately I am short on time to complete the answer for you, However, now you know the angles, you can calculate two possible locations for x. Then, using the third point c you can calculate which location is correct. rx & ry values are the return values (should be in an array) of the two intersection points on a circle, if that helps clarify things. Do this for the first 2 circles, then again for the first and last. If either of the results from the first iteration compare with the results from the second (within some tolerance, probably), then you have the point of intersection. It's not a great solution especially when you start adding more than points into the process, but is the simplest I can see without going to solve a system of equations. You may use spatial API from postgis (St_Intersection, St_buffer functions). As fmark noticed, you must also remember that Postgis uses planar algorithms, but for small areas, using equi-distant prjection does not introduce much error. Not the answer you're looking for? Browse other questions tagged distance algorithm geodesy or ask your own question. How to perform trilateration using 3 lat/lon points without distances? Calculating Latitude/Longitude X miles from point? 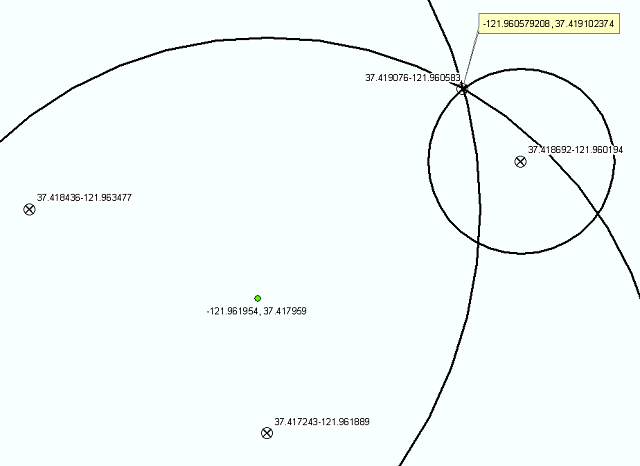 Calculate distance in km to nearest points (given in lat/long) using ArcGIS DEsktop and/or R? Calculating number of degrees of longitude and latitude between points at same latitude on map?